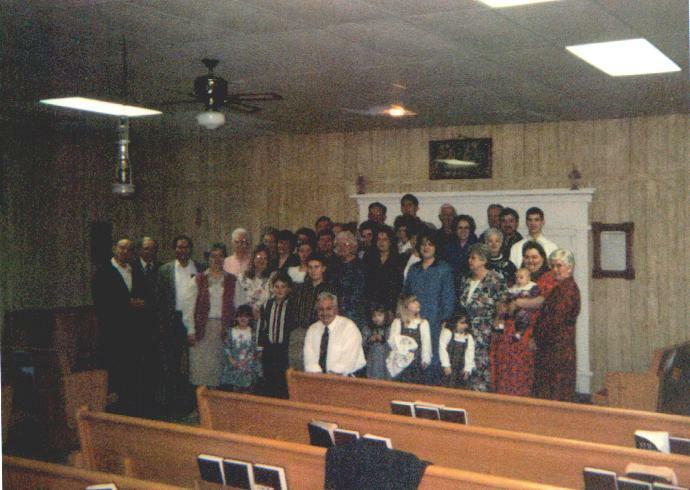 New Bildad Primitive Baptist Church was established in 1809 in Dekalb County Tennessee. God has been gracious to us here at New Bildad. We believe in only one true and living God, the Father, the Son, and the Holy Ghost, and these three in one. We believe that Scriptures of the Old and New Testaments are Divine authority and the only rule of faith and practice. We believe in the total depravity of the human nature and that a recovery from that state is wholly of the free sovereign mercy and grace of God in Jesus Christ. We believe that God from eternity purposed to save a people from their sins for His own name's sake, and in His infinite wisdom, He devised the plan and appointed every means necessary to accomplish the great end of their redemption, which He effects in His own time by the operation of the Holy Spirit. We believe that God from eternity purposed in himself for His own glory to make a display of His wisdom, power, justice, goodness, and truth in the world of creation and revelation which He made in the disposition of His providence. We believe that sinners are justified before God by the imputed righteousness of Jesus Christ and such as are born of the Spirit of God are kept by the power of God through faith unto eternal salvation. We believe that good works are the effects of the faith of God's elect and follow being born of the Spirit of God and are evidence of a gracious state. We believe that Baptism, The Lord's Supper and washing of the saints' feet are ordinances of Jesus Christ and none but those who have professed in Christ according to His will are fit subjects for either. We believe that Baptism by the burial of the person in water is the gospel baptism of the penitent in Jesus Christ. We believe that no minister has any right to administer the ordinances of Baptism only such as have been regularly baptized and come under the imposition of the hands of the Presbytery by the authority of the Church of Christ. We believe in the resurrection of the dead and that their vile bodies will be raised and fashioned like unto the glorious body of Christ, when they will be fitted for eternal happiness and the bodies of the wicked will be raised unto everlasting contempt. Our True Desire is to worship the Lord in Spirit and truth.